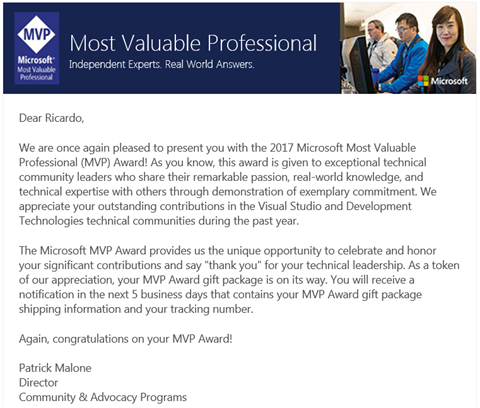 It was with great pleasure that I read Microsoft’s email today announcing me that I had renewed as MVP for the third year! 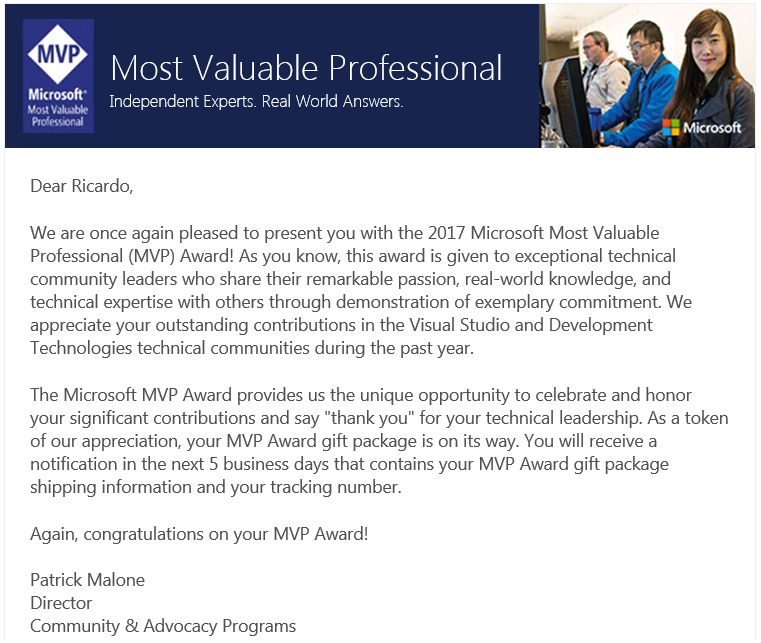 Being an MVP is both an honor and a privilege, and I feel both proud and humble to again be a part of this fantastic group of people! Thanks, Cristina, for this! I also want to congratulate all of the other Portuguese MVPs that were renewed this year, and leave a word of comfort to those who haven’t. All the best, guys (and lady)! 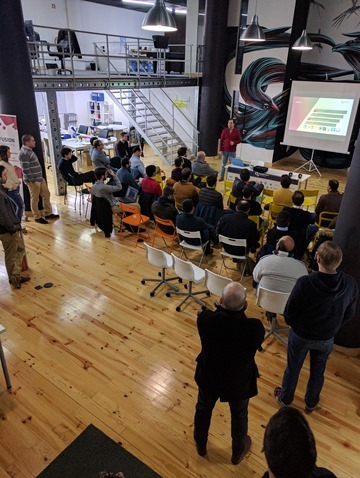 This post is based on the presentation I did for Porto Tech Hub 2015, Microsoft ♥ Open Source, slightly revised and augmented. I intent to demonstrate that Microsoft’s involvement with open source is not exactly new. Lots of APIs are now open source, others will follow! Applications are being considered for release as open source! But, let’s think for a moment… is this actually new? Hmmm… this doesn’t seem good for open source, does it? Nice! At the time, AJAX Control Toolkit offered some cool features that would integrate nicely with ASP.NET! Interesting! Who would have thought? Microsoft was then the 17th top contributor to the Linux kernel, even for “selfish” reasons – they wanted to be able to run Linux inside virtual machines, and also that Linux could run Windows VMs. Oxite was an attempt at building an open source CMS, which was discontinued. Eventually, some of the people involved moved to Orchard. Nice to see that VS includes jQuery and Modernizr in their ASP.NET templates! Wow, this this is getting interesting! All of MVC, Web API and related stuff is now open source! It seems they are getting serious about this! Visual Studio now has Git support! War is over! All peace! Finally, the Microsoft Ajax Content Delivery Network makes available all of these and more: http://www.asp.net/ajax/cdn. Azure Marketplace and MSOpenTech VM Depot feature hundreds of open source projects and VMs. Azure itself has supported from the beginning Linux virtual machines. So, as you can see, open source and Microsoft’s engagement is not exactly new. Microsoft has made important contributions to open source and appears to be willing to go even further. Not sure if Windows or Visual Studio themselves will ever be open source – I doubt it – but I think we will see an increasing push towards cross platform and open source solutions in the Microsoft ecosystem. These are interesting times indeed! UPDATE: you can find the slide deck here. As I mentioned earlier, the Portuguese MVPs are organizing the MVP Showcase 2015 event, this Wednesday, April 22nd, in Lisbon, at Microsoft’s premises. The keynote will come from Cristina Gonzalez Herrero (@crisgherrero), the head of the MVP program for Portugal, Spain and Italy. Como disse antes, os MVPs portugueses estão a organizar o evento MVP Showcase 2015, na próxima quarta-feira, 22 de Abril, em Lisboa, nas instalações da Microsoft. A apresentação será feita pela Cristina Gonzalez Herrero (@crisgherrero), a responsável do programa MVP para Portugal, Espanha e Itália. Espero ver-vos todos por lá!